Margins are tight—Ed’s message of “finding the dime(s)” is imperative. Planting season will arrive soon. 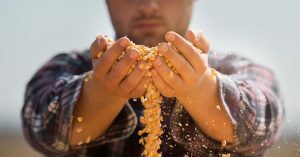 Do your customers have a pre-harvest marketing plan for their 2018 crop? Let Ed show you his plan and suggest a few ways it can be adapted by your farming customers. Objective: Buy crop insurance to protect my production risk, and have 75% of my anticipated corn crop (based on APH) priced by mid-June. Price 15,000 bushels at $3.75 cash price ($4.25 Dec. futures) using forward contract/futures hedge/futures fixed contract. Price 10,000 bushels at $4.05c/$4.55f, or by March 29, pricing tool to-be-determined (“tbd”). Price 15,000 bushels at $4.35c/$4.85f, or by April 30, pricing tool tbd. Price 10,000 bushels at $4.65c/$5.15f, or by May 29, pricing tool tbd. Price 15,000 bushels at $4.95c/$5.45f, or by June 13, pricing tool tbd. Price the last 10,000 bushels at $5.25c/$5.75f, or by June 27, pricing tool tbd. Plan starts on January 1, 2018. Earlier sales may be made at a 40-cent premium and would be limited to 30,000 bushels. Ignore decision dates and make no sale if prices are lower than $3.75 local cash price/$4.25 December futures. Exit all options positions by mid-September, 2018. My initial price objective is $4.25 Dec’18 futures, or $3.75 cash at harvest. I assume a basis of 50 cents under in SW Minnesota. This should be adjusted to reflect basis expectations in your area. BTW, these initial price objectives also reflect my estimate of production costs in SW Minnesota. Do you need to adjust according to production costs in your area? As written, the plan indicates that I will do no pricing if prices do not rise to my minimum levels. However, my preference is to get 20-40% priced before harvest, even if minimums are not reached. What is your preference? The decision dates tied to all other price objectives make this a real plan for action. When a decision date is reached, I intend to price the grain, as long as the price opportunity is higher than my minimum price objectives ($4.25 futures or $3.75 cash). Decision dates are clustered in the spring because that tends to be the best time to get something done (on new and old crop grain). Where would you place your decision dates? Finally, I am remarkably vague concerning the pricing tools used to price new crop grain. I am purposely vague because the choice of a pricing tool (forward contract? futures sale? options?) is a tactical decision that does not need to be made until action is needed. What basis is implied in the forward contract? How much do the options cost? Is there a carry in the market beyond harvest? Has the market changed, and now displaying a solid uptrend? Which pricing tool to use is a decision that can wait until the last minute.